Ronald “Duane” Torrance, 84, of Macomb, IL, passed away on Sunday, September 2, 2018, at 4:55 a.m., at Wesley Village, Macomb, IL. He was born Saturday, April 21, 1934, in rural Sciota, IL, the son of Carl and Ruby (Graves) Torrance. He married Terecia Kay VanArsdale on December 19, 1953, in San Diego, CA. She preceded him in death on November 8, 2016. Duane is survived by his children: Jo Ellen (Jeff) Kirby of Roseville, IL, Janise (Mike) Casteel of Roseville, IL, Scott (Monica) Torrance of Macomb, IL, and Lori (Randy) Plath of Burlington, IA; nine grandchildren: Shawn (Lisa) Kirby of Oswego, IL, Christy (Jesse) Thornton of Roseville, IL, Cara (Kris) Guenther of Albany, IL, Kevin (Heather) Casteel of Edwardsville, IL, Steven (Maria) Casteel of Lee’s Summit, MO, Kimberly (Lucas) Glasgow of Cedar Falls, IA, Kristin (Jordan) Goldesberry of Springfield, IL, Gabrielle Torrance of Macomb, IL, and Nicholas Torrance of Macomb, IL; nine great-grandchildren; one sister, Darlys (Jack) Pugh of Columbus Jct., IA, and one brother, Ardene (Margie) Torrance of Burlington, IA, and many nieces and nephews. He was preceded in death by his parents, his wife and a sister (Ramona Mathews). Duane graduated, as valedictorian of his class, from Media-Weaver High School in 1952. He attended the University of Illinois the next fall, hoping to play football. After an injury, he transferred to Western Illinois University. Shortly thereafter he enlisted in the United States Navy. He was voted Honor Man and graduated top of his class at the Great Lakes Naval Academy. He was stationed at San Diego, CA, and served as a sonar operator during the Korean Conflict. After receiving an honorable discharge from the Navy, he returned to the Raritan area to farm. He also built and operated the Raritan Feed and Farm Supply for many years. He eventually sold the feed mill and concentrated on farming, which he did until his retirement. Duane was also active in many community activities. He was a member of the Raritan Reformed Church, the Roseville United Methodist Church, and eventually the Wesley United Methodist Church. 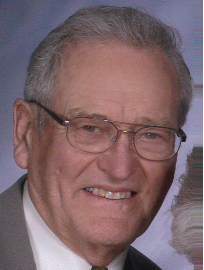 He served as Sunday School superintendent, Sunday School teacher, deacon, choir member, Administrative Board and Chairman of the Building Committee while a member of the various churches. In addition, he served as a member of the Raritan Fire Department, Warren County Fair Board, Illinois Beef Association, Illinois Polled Hereford Association, Roseville American Legion, Roseville Masonic Lodge, Henderson County Soil and Water Conservation Board, Farm Service Agency Committee, and served as Chairman of the Board of Directors of the Raritan State Bank. He also served as a salesman for Morton/Americana seed corn and Archer Oil for many years. He was named a Prairie Farmer Master Farmer in 1998. He was also chosen to participate in the Honor Flight program. In his spare time, Duane enjoyed participating in sports, especially bowling, basketball , softball and pool, watching any kind of sports of television, and attending activities for his children, grandchildren and great-grandchildren. He traveled extensively with his wife. Funeral services will be Friday, September 7, 2018, at 10:30 a.m., at the Roseville United Methodist Church, Roseville, IL. Visitation will be Thursday, September 6, 2018, from 5:00-7:00 p.m., at the Roseville United Methodist Church, Roseville, IL. Burial will be in the Raritan Cemetery, Raritan, IL. Roseville American Legion Post 614 will perform military honors. Memorials may be made to The Wesley Village McCreery House, Roseville United Methodist Church, and Raritan Fire Department. Please sign the online guestbook at www.wisefamilyfuneralhome.com. Wise Family Funeral Home, Roseville, IL, is in charge of the arrangements.